My kids were amazed when these boxes started arriving at our house in mid-December. A few weeks before that, I let them know that I had applied for a chance to give away a ton of Zhu Zhu Pets to a local charity. My kids have had a great time with Zhu Zhu Pets over the years, and we have been lucky with the chance to play with the latest and greatest toys from Cepia. So, when Mom Select contacted bloggers seeking some who wanted to share the fun with local charities for Christmas, I was hopeful that I would be one of the chosen! 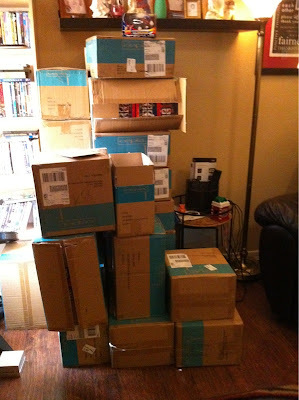 The boxes arrived over 3 days, and I piled them up in the corner. Cepia sent a variety of Zhu Zhu Pets and accessories. 100 bloggers across the country received 100 toys to share in their local community. The boys get out of school early on Wednesdays, and I really wanted them to be part of this donation. 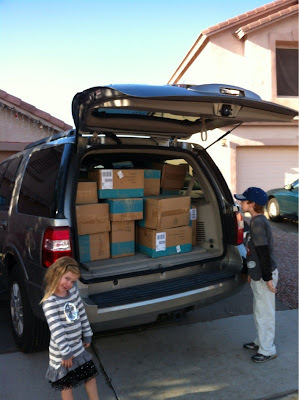 When they got home, we loaded up the truck with the boxes and drove them over to our parish. Our church was collecting gifts and food for needy families, and we were excited at the opportunity to make a huge donation. When I stopped into the office and let them know I had a donation, they were happy to take it. When the four of us showed up in the office piled high with boxes, they were surprised! Even more surprised when I let them know I had more boxes in the car! The kids were excited to show them the toys, and explain the accessories, to make sure that the kids got a great set of Zhu Zhu toys. When we left, Nate turned to me and said "That felt really good!!" And, it reminded Colin of our project years ago of donating birthday bags (bags with cake mix, frosting, candles) and he said he would like to do that again, but add small gifts to the bags as well. I feel very fortunate that we were able to bless our church families thanks to Cepia and MomSelect. It was great to include the kids in such a wonderfully large donation. It's great, too, working with companies who are dedicated to giving back to the community in large ways. I know kids across the country were excited with their new toys, thanks to the efforts of Cepia and Mom Select. It was a great note to end 2011, and I think it was a push for us to be more aware of the needs in our local community. That is AWESOME! I'm also glad to know what a great company they are. We have spent a fortune on Zhu Zhu pets in this household over the past couple of years!